Kenneth L. DeJong: Bio & Choral Music | Santa Barbara Music Publishing, Inc.
Kenneth DeJong is Conductor and Artistic Director of the Lyric Arts Ensemble (17 voices and chamber orchestra) in Bellevue, Washington. His educational journey includes a Bachelor of Music Education from Seattle Pacific University and graduate studies in conducting at the University of Washington and the University of Southern California. 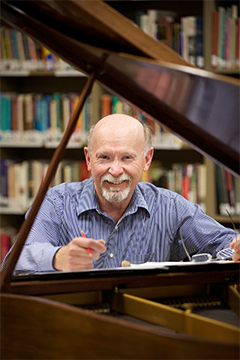 He has taught at numerous colleges and universities and conducted many collegiate,, church, and community ensembles, including the Seattle Symphony Chorale. He served as conductor for an annual mid-winter retreat for church musicians at Blue Cloud Abbey, SD, for ten years, and continues to serve in various churches as arranger, conductor, and organist. In 2012, he left his position after 25 years as Music Director and Organist at Saint Andrew’s Lutheran Church in Bellevue to commit his primary energies into composition. He recently completed a commissioned Magnificat setting for a choir to sing at Worcester Cathedral in 2018. A member of the Northwest Baseball Umpire Association, he serves high school and other recreational organizations. Kenneth L. DeJong has 1 titles published with Santa Barbara.